Increase user engagement, acquisition, and monetization through actionable analytics. It is built to play a major role in customer satisfaction. The ability to understand what works to upsurge customer conversions, and create a better user experience. How to improve the Chatbots accuracy? What best works for increasing conversions? These rates represent the percentage of customers who left behind their order instead of purchasing. To answer all the above questions, Royal Cyber has built a solution. Royal Cyber has built a solution integrating Chatbot with an analytics tool for bots. 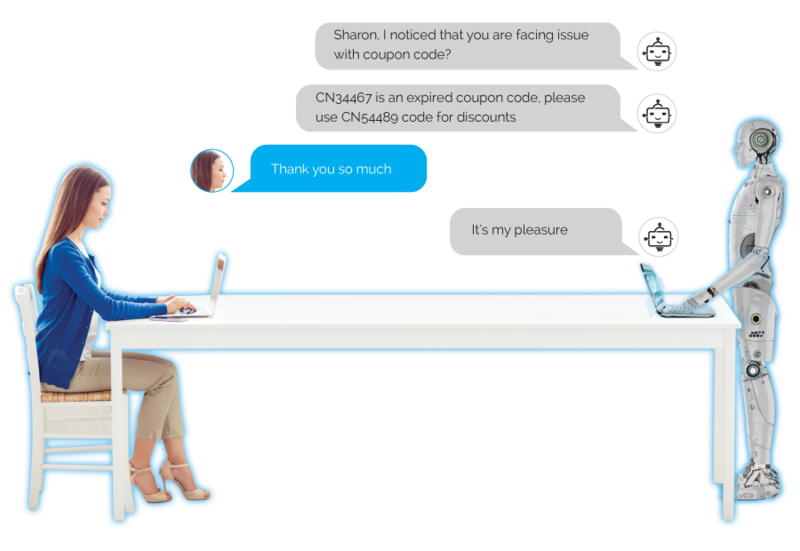 It helps the Customer Service Representative to advance their human-to-bot communication by isolating the bottlenecks, filtering conversations, and understanding engagement. Increase Your Customer Engagement Rates Now! When the customer is struggling on the site, Analytics will capture and flag it to the corresponding team and as a trigger for AI Agent Bot. Analytics will pass on session details for the AI Agent Bot to comprehend the situation and prepare. AI Agent Bot will initiate a chat window on the customer screen. ChatBot will introduce and acknowledge the problem at hand, and the solution. The customer would have an option to engage with the AI Agent Bot for assistance or request a callback to resolve the scenario.